There has to be an easier way. That simple exclamation would change the fence industry. Jeff Lancour and Ron Chouinard were working for a construction company when they were asked to install a large amount of chain link fence. They found the 50 foot rolls of fabric to be heavy and hard to handle. They were told to roll it out by hand, stand it up and stretch it with come-a-longs while temporarily attaching it with ties. To find an easier way, the two developed the first Installink that operated with a tractor. It worked better than they expected so they thought they would show it at an industry trade show. The response was good. But selling them was difficult because fence installers did not believe the Installink would work as they were being told. Fencing companies were also beginning to embrace the skid-steer so Ron and Jeff re-engineered the Installink again to attach to a skid-steer. To prove how good the new fence machine was, they took it to an Air Force Base where a fence company was installing chain link. The crew was not receptive. They thought they could put the fence up faster without the Installink. Ron and Jeff wired two 50 foot rolls of chain link together to show them how to put up larger rolls with the new machine. They left the Installink at the job site for them to use. A week later, the fence crew was not about to return it. For the next year, the two demonstrated the Installink on job sites to show what the machine could do. Word eventually spread and orders finally came in. Since then, Ron and Jeff have focused on products that aid installers on the job. At the same time, they showed that the job could be done easier and faster with fewer workers. Today, it is difficult to stay in business without the use of special fencing equipment. When prisons began to expand, Ron and Jeff took the Installink on the road to install fabric at prisons. They showed up after the posts were in place and the fence framed to stretch fabric. On one job, the contractor asked that they also tie the fabric. Because it was a prison, they wanted it tied a certain way. The ties had to be individually cut and bent to meet their needs. The process was slow and difficult. Thinking there had to be an easier way, the two devised a pre-formed tie that was easy to install and provided the security that the prison demanded. It was the first in a line of Twist Tight Fence Ties. 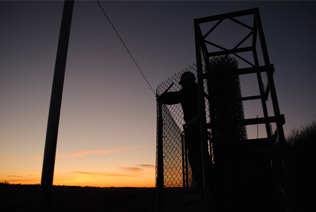 Their foresight and innovation has made it easier for fence crews to install commercial chain link fence with less physical strain and greater efficiency. L&C Enterprises-USA continues to search for ways to find easier ways to get the job done fast.